The Chili Bar run is one of California's premier and most popular whitewater runs! Dependable flows through the spring and summer, and weekend flows all year round make Chili Bar a very popular section of river. During times of the year when most other California whitewater rivers are too low to boat, the Chili Bar powerhouse still turns on at 9 AM and turns off around noon. Kayakers and rafters flock from all over to boat here. The bonus is that this is a very high quality run with fun rapids, wonderful play spots and good scenery. On summer weekends, the river is mobbed by rafters and kayakers. Early in the morning and late in the day you can still find relative solitude. Put in: Chili Bar has a large parking area and gravel beach for launching rafts and kayaks. There is a per car and a per person fee to launch. There are also free registration tags at a kiosk that must be filled out and attached to every boat that launches on the river. There is a small store, drinking fountains and bathrooms. This area is now owned and operated by The American River Conservancy. Take out: There are several take out options in the Coloma area. Most of these options charge a per person fee. Each of the campgrounds along the river allow launching or take outs only by those paying to stay there or paying a day use fee. There is no fee for river access at the highway 49 bridge and at a couple other spots. Boater take outs are also allowed at Marshall Gold Discovery (State Historic Park). There is a per car fee at Henningsen Lotus Park. The Coloma Shuttle transports people from Coloma to Chili Bar in the morning and from Salmon Falls to Coloma in the afternoon & evening. If boaters use a shuttle service to get to the put in or from the take out, it can reduce air pollution, and reduce traffic congestion. As of 2013 Coloma Shuttle has a 14 passenger van and rides cost $10. A 12 ride pass costs $100. Reservations are usually needed for weekends. Call (530) 303-2404 to make reservations. The Coloma Shuttle is operated by the non-profit American River Recreation Association (ARRA). 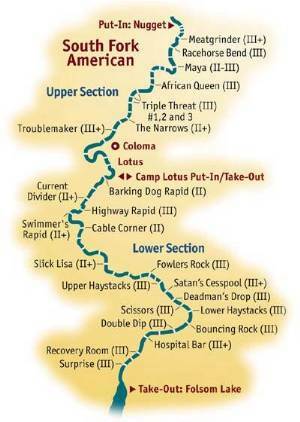 You can print out these river maps and take them with you: Map #1 or Map #2. There are a number of active paddling clubs that frequent this river. Listed below are just a few. Sierra Club Loma Prieta Ch. There are several great write-ups out there about the Chili Bar run. El Dorado County has this mile-by-mile description, as well as other information about many other activities in the area. Bill Tuthill also his pictures and description of the run at cacreeks.com. Then there is the American River Page that has a wide range of information about the river and the region, including a forum and photo gallery. You can get more information from California's Whitewater Community at boof.com. Or a closer source of information about the Chili Bar run maybe obtained from The River Store. Protect American River Parkways works to protect the North and Middle forks of the American River, along with The American River Conservancy. The owners of the Nugget River Park, just upstream of Chili Bar often have a slalom course set up on the river. This course is used for several races, including during the fall American River Festival. Paddlers who wish to practice here can call (530) 644-6093 to purchase access to the Nugget parking area. Support their efforts to maintain this nice slalom course. The Chili Bar put-in is on the northwest side of the bridge. This area has restrooms, picnic areas, phones, and disabled access. Also located here is Chili Bar Hole, a playspot. This is a fee area. A long and sometimes dangerous rapid with large boulders and hidden holes. There is an excellent trail for scouting and portaging on river right. It is an old railroad grade. Hazard: There have been two fatal foot entrapments in this rapid at summer flows. It is unknown to this author, exactly which parts of the rapid are most hazardous for foot entrapments. There has been at least one flush drowning at high spring flows. This is a small, wide rapid that has a wonderful surfing wave at many flows. There are large eddies on both sides. The river left eddy is particularly huge. Most of the current flows to the right of a rocky and bushy island. The drop is steep, culminating in a large wave hole that buries kayaks and gives raft riders a thrill. The wave/hole is a popular kayak playspot, so there will usually be a line of kayakers waiting in the river right eddy. Boaters can land on river right, just before a sharp left turn. Two composting toilet are up a short trail. Some groups will stop for snacks or lunch here, but there is not a lot of room to land many boats. Rafters need to leave enough room for other groups to land and use the toilets. The river enters a very pretty section with rock walls. There is mild maneuvering around rock outcroppings or boulders in the channel, but nothing too difficult. Near the end, a large rocky island is a popular rest stop. This is an alternate right side chute at Troublemaker rapid. The chute is steep and tubulent with a high likelyhood of hitting the right wall. This route is taken much less frequently than the normal curving left side route. This short but steep and tricky drop is at the end of the run and thus convenient for spectators, photographers and other lovers of entertaining carnage. The current splits around a rocky island. The standard route is to the left side. Several ledges and turbulent waves persuade boaters to paddle on the outside left as the channel curves sharply right. Kayakers often tip over here. Those still upright must paddle hard to get to either side of Gunsight rock which forms the final steep drop. Paddle past or through some smaller ledge holes then eddy out and see what happens to the next boaters through. The right side of the island leads to a steep, narrow and turbulent chute called, Double Trouble. This is not real frequently run as it can easily flip rafts. Some boaters do enjoy it. Hazard: About 50 to 70 yards downstream of the main rapid, just right of center of the channel, is a group of boulders. A small hump and pourover just upstream of these boulders is formed by a large underwater boulder with a crack through it. In 2009 there was a fatal foot entrapment here when flows were 2200 cfs. In 2008 there was a nonfatal foot entrapment with flows of 1500 cfs. At the lower flows, rescuers were able to get onto the boulder and support the victim to keep the victim's head out of the water. At the higher flows, rescuers were unable to reach the victim until the flows dropped. If you swim in Trouble Maker, swim aggressively to stay away from this dangerous boulder. If you swim in Trouble Maker, swim aggressively left into the main channel to stay away from this dangerous area. If you get swept into this area or similar areas, keep your feet up. The river bends to the left and affords a view of motor homes and travel trailers lined up above the river on the right bank. The river continues curving to the left as it drops downa a wide rapid. Several large boulders at the bottom right offer targets for those without boat control or for those looking for extra fun maneuvering. The bridge at State Hwy 49/Coloma Street is a potential access point but there is limited parking along the road. This is an easy and very popular access point. There is a wide beach and a big area for beginners to practice in the slow current. The boat launching area is at the furthest downstream end of this large park. There are large playing fields, restrooms and picnic areas. Hiking trails lead upstream along the river. There is a fee to park a car. Baseline release is 1300 cfs for 3 hours (Saturdays and Sundays during the summer will have longer releases and except in Super Dry years the flow will be higher). Boatable flows can also occur on other days of the week and are not always predictable. Information is summarized from SMUD "Minimum Recreational Flow for SF American River below Chili Bar Dam by Water Year Type, Duration and Flow in cfs"
Water Year Type is determined by Department of Water Resources. Search for Bulletin 120 Summary of Water Conditions. The flow gauge at Chili Bar is maintained by PG&E. Flow information is distributed and stored by CDEC. You can obtain daily flow information in numeric form at CDEC website, but the gauge home page is at Chili Bar Gauge info. If there is no graph visible above, click on this link to a CDEC graph. Convenient flow information for almost all rivers in California and many other western states can be found at Dreamflows.com. You can also call the River Store (530) 626-3435 or the El Dorado County Flow Phone at (530) 621-6616. Chili Bar Reservoir can only release water that it receives from Slab Creek Reservoir, which is operated by SMUD. At the bottom of the SMUD page is a link to a pop up page with an 8 day and hourly release prediction. PG&E can shape and alter the timing of their release at Chili Bar, but the total volume of the release has to be the same as what comes from Slab Creek. Use the information below to convert the acre feet readings into cfs. 1 cfs = 1.983 acre-feet per day which is close enough to 1 cfs = 2 acre feet per day. 1,000 cfs for 24 hours = 2,000 acre feet per day. 100 acre feet per hour = 1210 cfs for that hour. 50 acre feet per hour = 605 cfs for that hour. 120 acre feet per hour = 1450 cfs. Bill Center reports that boatable flows are most likely to occur when daily release from Slab Creek is 1,000 acre feet or more and when hourly release is predicted be be higher than 100 acre feet. Each boat must have a free permit tag attached. Permit tags are available at the put in, at an information board. Grab one, fill it out and tie it to your boat. Hazard Rock, view from above. FERC, in a rather unique ruling, aided parties trying to reach settlement on the South Fork American River in California. This ruling pushed back the deadline for filing in the new Energy Policy Act process. We feel this was an important step in allowing settlement on this project. After years of planning, studying and down-to-the-wire negotiations, a settlement was signed on January 29th for the Upper American River Project and the Chili Bar Project. The settlement agreement signed by American Whitewater will breathe new life into the American River. Recently, the Sacramento Municipal Utility District (SMUD) made an unexpected move to advocate for policies that would undermine environmental protections in the Clean Water Act and the Federal Power Act. American Whitewater worked with SMUD and other stakeholders in negotiating a settlement agreement for the Upper American River Hydroelectric Project (UARP) that was signed by all parties in 2007. The final license for the project was issued in 2014 and included whitewater recreation flows to mitigate the impacts of its project.